This pricipal Town of the Green Kalahari is 820km north of Cape Town and 875km west of Johannesburg. By uniting Christian Schröder’s 1871 mission station, Olyfenhoutsdrift and the Upington police station, the town of Upington, named after the first Attorney General of the Cape, Sir Thomas Upington, was formed. Originally known as Kharahais, bound by the Orange River and the Kalahari desert, Upington is the principal town and commercial, educational and social centre of the Green Kalahari, owing its prosperity to agriculture and its irrigated lands along the Orange River. Upington enjoys a summer rainfall and a hot climate. An ideal winter holiday resort, its facilities are excellent and the countryside contrasts semidesert reds with the emerald and olive greens of fertile vineyards. Linked by air and road to most parts of the country, the town is accessible, offers excellent accommodation and has a well-developed commercial infrastructure. On the Kalahari-Namaqua-Namibia (Nama-kwari) route to and from Johannesburg and Cape Town, it is a convenient stopover for those travelling to the Augrabies Falls National Park, the Fish River Canyon and the Kgalagadi Transfrontier Park. In front of the police station, the statue honours the ‘mounties’ who, on camels, patrolled the harsh desert territory. The attractive entrance to Die Eiland Holiday Resort was declared a national monument in 1982. The palms were planted in 1935 by officials of the Department of Lands. The avenue of more than 200 date palms planted 9m apart is 1 041m long, making it one of the longest and densest palm avenues in the Southern Hemisphere. Schröder Str. Completed in 1911. Built by the Reverend Christian Schröder in 1879, it can be seen from the bridge on the Groblershoop road. Test yourself in the SAD-triathlon before shopping ‘til dropping at fleamarkets offering everything from the ?delectable to the divine. 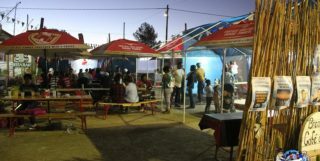 The Kalahari Kuierfees is loads of fun with first-class entertainment. Tel 054 332 1100. Regarded as the founder of the region’s irrigation system. Inhabitants from Raaswater and Paballelo earn an income by creating intricately decorated crafts. Tel 054 332 6064. People with disabilities can learn life skills by means of selling handmade arts and crafts and organising donkey cart drives. Tel 054 339 0662. A short drive from the town centre into the industrial area takes you to the five-cellar co-operative - the largest in the country and the second-largest in the world! Wine tasting and tours are offered. Tel 054 337 8800. Le Roux Str. Built in 1861 and renovated in 1947, it has been a national monument since 1982. A sundowner cruise on the Orange River. Tel 082 575 7285. George St Leger Gordon Lennox, legendary rogue and Robin Hood of the Northern Cape, died in Upington during the 1918 flu epidemic and is buried in the local cemetery. You can view rainbow-coloured stones fashioned by the ancient earth at the Museum Office and in the foyer of the Oranje Hotel. Stones include beryl, amethyst, agate, tourmaline, aquamarine, jasper, rose quartz and tiger’s eye. Cotton cultvated in the Siyanda irrigation region is considered among the purest in the world. Tel 054 334 0015. On the Louisville road, the co-operative is the second-largest and most modern of its kind in the world. More than 8 000ha of sultanas and 1 000ha of hanepoot grapes are cultivated on the Lower Orange River. Freshly-packed dried fruit is sold at the Kalahari Oranje Museum premises. Tel 054 337 8800. A small game park about 13km north of Upington, stocked with gemsbok, zebra, springbok, ostrich, eland, hartebeest and mountain zebra. Tel 054 332 1336. Sudrah Riding School in Upington offers various equestrian services, including dressage, showing and equitation. Situated on the banks of the Orange River, Belurana River Manor is a luxurious Victorian Guest House offering the visitor old world charm and hospitality. Tuscan style guest house set in the eastern part of Upington on the way to the Kgalagadi Transfrontier Park and airport. Comfortable, spacious, individually appointed en-suite rooms. The Africa River Lodge imbues the magic of the Kalahari! African Vineyard Guest House is nestled in the lush vineyards of Kanoneiland, near Upington and Keimoes, next to the Orange River in the Northern Cape. Allianto Boutique & Spa is located in an Original Pioneer Home and was one of the first permanent structures that were built in Upington. Anwil Guest House is situated in a calm and serene neighborhood with 4 well equipped en-suite bedrooms rooms and 1 self catering unit and is suitable for both business and leisure travellers. Only 12km from Upington, the 56m high Augrabies Falls is a must see. The camp site is set under shady trees and within walking distance from the Falls. Desert Palace is the haven that you\'ve been searching for; set in the Oasis of the Kalahari where you can forget the stress and strains of the city life! Dune Valley Farmhouse and Family Field Chalet makes an ideal stopoveron your to the Kgalagadi Transfrontier Park. 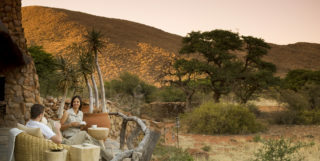 Elandspoor Bush Camp is a haven for outdoor enthusiast who likes to experience this semi-desert landscape and all it has to offer. A guesthouse striving for quality and professionalism. Pet friendly with a beautiful garden to relax in. 6 THATCHED ROOF SELF-CATERING CHALETS. Perched on a dune, with endless views of the red Kalahari sands, this unique unfenced self-catering wilderness camp is a place of peace and tranquility. Klassique Guest House is conveniently situated in the central business area of Upington in the Northern Cape. The horizons stretch further and the sky is bigger than anywhere else. The ample gardens and sparkling pool contribute to the quite country ambiance of this Oasis in the Kalahari. The Protea Hotel Oasis has been designed to create a comfortable, modern and convenient home for the discerning traveller. Come and relax in the finest hotel in the Northern Cape. Experience the true magnificence of the Orange River right on your doorstep. Enjoy this fully equipped self-catering accommodation without compromising a lodge atmosphere: the at-home-from-home ambience. Situated on the banks of the Dry Nossob Riverbed, Twee Rivieren is the administrative centre and biggest rest camp. Surrounded by Camelthorn Trees and overlooking a Waterhole, this camp has four Riverside Cabins built on stilts and connected by a walkway way. Urikaruus is accessible by passenger vehicles. 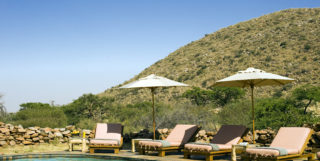 Vischgat Game Lodge, your perfect weekend-breakaway, family holiday and hunting destination. 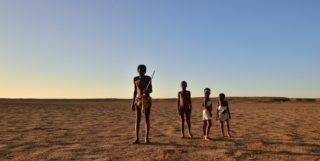 Situated 60 km from Molopo Kalahari Lodge and 50km from Askham. Want to go full throttle in your adventures? Then make time to see stunt bikes and fun racing at the Gemsbok Rally, happening in Upington from 26 to 28 July 2018. The Upington Landbou Expo will take place from 2 to 4 May 2019 at the Upington Showgrounds.